Travel Line by Peak Design is another new backpack campaign killing on Kickstarter. Below in this article, you will learn whether is this expensive travel backpack really worth a buy. Finally, another cool backpack Kickstarter campaign after the Använda. So before we get into the detail, let’s learn a little about the background. No many project creators can raise over a million on Kickstarter, and that’s even fewer people can make it to several million dollars on more than one campaign. Peak Design is one of them. So far, Peak Design has created 8 projects (including this Travel Line), all got funded, and 4 of them are over a million dollars. Out of those 4, there is one backpack campaign is even reaching a staggering $6.5 million. We will discuss more on that project later in this article. So, what is so special about the Travel Line Backpack? Similar to their previous backpack, the backpack features minimalistic design and a good versatility for the camera gear and travel use. It comes with a number of thoughtful pockets and handy compartments design. For this version, they scale up to a size of carry-on style backpack and have included the cubes & pouches system so to keep many more item as well as keeping it organized. 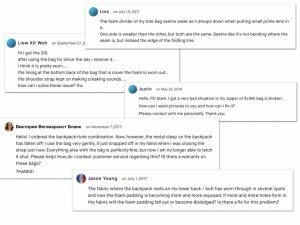 For sure, it raised millions, but still, the first thing that comes across my head is — how is this backpack get so many people over it? This is not the best-rugged travel backpack for sure, neither is it the unprecedented super versatile bag or can shoot lasers. In fact, each of this expensive backpack costs you well over $250 (excluding taxes and customs duty). At that price, you can get 3x a good quality backpack like this one on Amazon. Then I came to a conclusion where the quality is quite good. 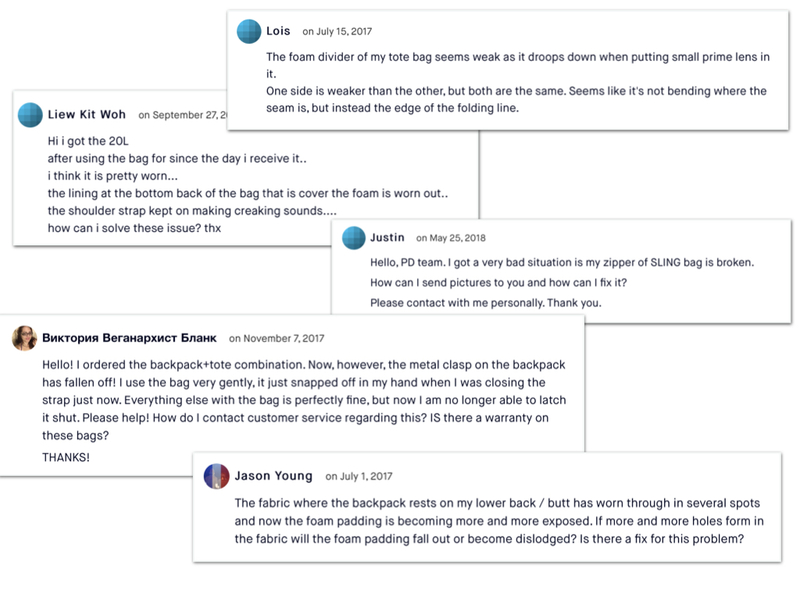 From the previous backers who supported their backpack before, most of them are satisfied with the overall quality. Although there are unavoidably a few complaints on the quality as well, as shown in the screenshots below, people are generally happy with the bag itself. Here is how the verified buyers from Amazon said about their backpack quality. One concern is about the weight of the backpack. This backpack weight 5.8 lbs and is slightly heavier than the other travel backpacks. Due to most airlines have ~15 lbs (7kg) weight limitation, this bag itself already took a big portion of that. Plus, since it’s a travel/daily backpack, the heavier aspect of the bag can be troublesome if carrying for long. Also, there are people not coming for the bag, but for the packing cubes/pouches instead. As for me, the cubes are overpriced where even each of the small size cubes cost you $24. At that price, you can pretty much get A SET of 4 packing cubes like this one. I would definitely recommend you to try for the cheaper option first, and if you really are not happy about it, return it to Amazon the next day and back Peak Design campaign for the packing cubes. Other than that, in addition to the weight, the shoulder straps are relatively too thin which may cause discomfort to the shoulder when carrying heavy things in the backpack. In overall, is it worth it? It’s a little overpriced, but still, a yes from us. Although we have mentioned some of the things which you need to be noted before backing this project, this project is still worth pursuing. Peak Design has a good name around the community and people are overall satisfied with the product quality (of the previous projects) as well as the good communication with the team. If you would like to support this campaign, go to the green link below and grab your deal. A thoughtful and versatile travel backpack by Peak Design.